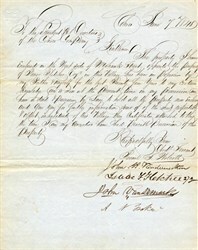 Letter to Directors of Cohoes Company dated 1848 signed by P. S. Wilcott, Isaac F. Fletcher, A. N. Braker, John Van Rensselaer, and John Vandermark. Cohoes became a mill town, where the Harmony Mills Company owned the houses, churches, stores and most other components of the workers' lives, thus by this total control preventing strikes and other labor organizing. Other independent mills sprang up around the system of power canals. Besides cotton, several of these mills made "shoddy" or cotton waste, used to contain the lubrication in the journal boxes of railroad trucks. By the 1930's, the Harmony Mills ended production. The power canals were a series of block-long canals at graduated elevations and connected by underground tunnels. Factories located between two such adjacent canals would be powered by a water wheel or turbine, taking advantage of the water flowing from the higher canal to the lower one. 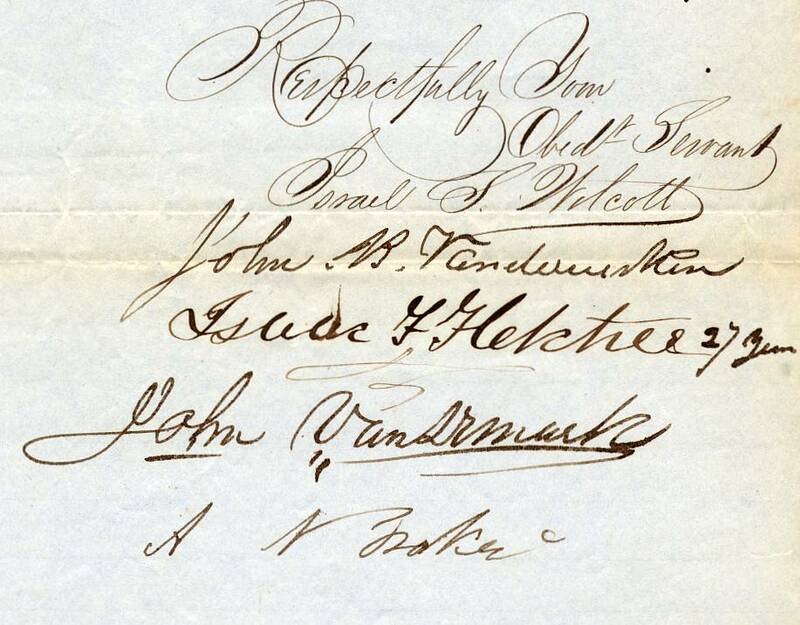 The Cohoes Company charged the various mills for how much water they used. The D&H's original freight station was built in 1853 and torn down after the D&H built a new freight station in 1914. Just north of the original freight depot was a similar-looking freight house for Harmony Mills. The passenger station was built in 1883. It is surrounded by over five major churches, an unusual grouping to be found near the tracks. Cohoes is an incorporated city located at the northeast corner of Albany County in the US state of New York. It is called the "Spindle City" because of the importance of textile production to its growth. As of the 2010 census, the city population was 16,168. The name was believed to have arisen from a Mohawk expression, "Ga-ha-oose", referring to the Cohoes Falls and meaning "Place of the Falling Canoe," an interpretation originated by Horatio Gates Spafford in his 1823 publication "A Gazetteer of the State of New York". Later historians posited that the name is derived from the Algonquian "Cohos," which is a place name based on a word meaning 'pine tree'. The majority of the city was once part of the Manor of Rensselaerswyck, a Dutch colonial feudal system; however the land north of a line crossing the Cohoes Falls (today Manor Avenue) was outside of the Manor and was owned by the Van Olohde family between 1725 and 1750. Rensselaerswyck was established by Killiaen Van Rensselaer, the patroon and a Dutch merchant. In 1632 he had an agent of his pace off an enormous triangle-shaped area around the confluence of the Mohawk and Hudson rivers, from the Peebles Island northwest to the Cohoes Falls and south to today's Watervliet; this area was the core of the future city of Cohoes. Starting in the 1690s the Patroon began to issue leases for the area of Cohoes, though he did reserve for himself a strip below the Cohoes Falls for the future site of mills.